This exhibit was featured in the Fisher/Wall Art Gallery within the Marathon Center for the Performing Arts in Findlay Ohio for 8 weeks. It was created to celebrate the first anniversary of the new Hawkes Crystal trademark collection. 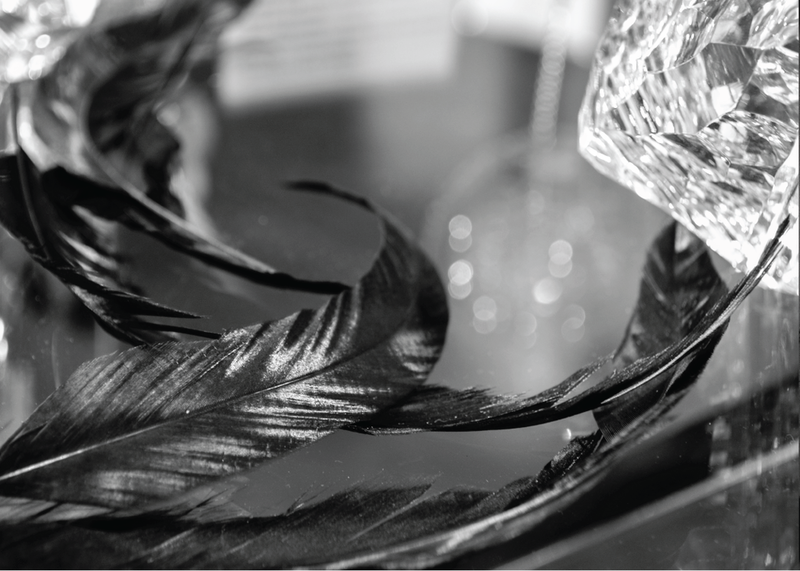 Tracing the century-long journey of Hawkes Crystal from 1880 to the vision that the new trademark owners hold for the next chapter of brilliant cut crystal. The gallery held original Hawkes pieces from the 19th century as well as pieces from the present cut by Hawkes own brilliant master cutter, Aidan Scully. I contributed to this project by leading overall design including floor plan and organization. I also independently created the print graphics necessary for this event including the timelines and invitations. This project allowed me to gain experience within the experiential design realmby active learning . The timeline for this project was a short 3 months and the budget was very low. I began by conceptualizing the story line Hawkes wanted to communicate, laid out different floor plans, gathered already existing materials, developed new graphics, and helped construct the exhibit. While the overall goal for the exhibit is to inform the public about a rare art form that is being practiced locally, I also decided to add another layer of revelation throughout the exhibit. This concept consisted of 3 over-arching themes; tradition, authenticity, and rebirth. These themes are outlined in more detail below. GOAL - To honor a traditional art form started in the 19th century by T. G. Hawkes. 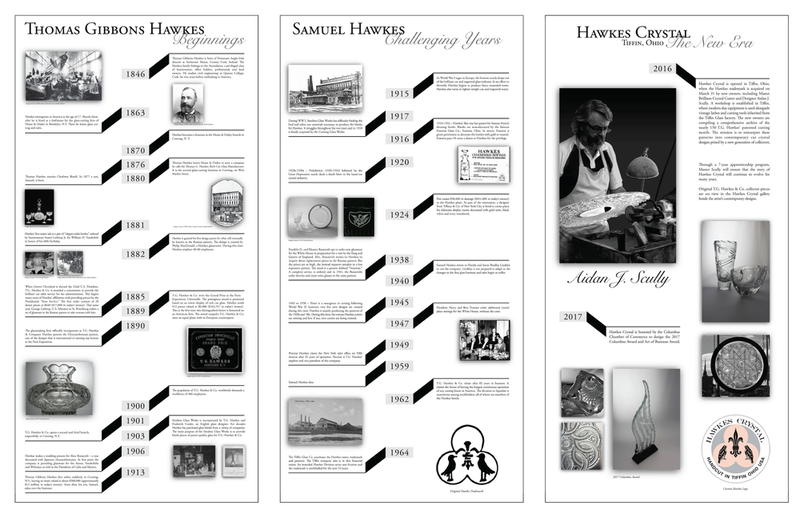 EXECUTION - A timeline of the journey was created as well as displaying pieces hand cut by T. G. Hawkes himself. GOAL - Understanding the difference between casted glass and hand cut glass. EXECUTION - Colliding the clear cut crystal with the rustic metal, wood, and stone textures of the workshop. Placing an actual lathe in the gallery as well as a video of a master cutter creating a piece. GOAL - Communicating the history and the significance of the rebirth of the trademark. EXECUTION - Featuring pieces from both time periods and displaying the original logo from the first Hawkes showroom.